Don’t take life too seriously with the Many Mustaches Set. Masculine-themed and completely irresistible, this unique stamp is perfect for Father's Day -- or any day! Use it for large gift tags, scrapbook pages, and cards... it's guaranteed to bring a smile! 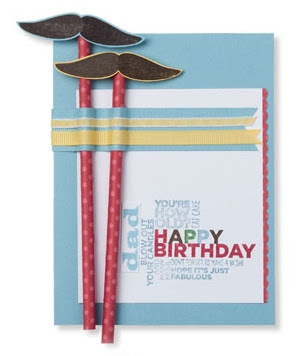 This card does double duty as a birthday card for dad and a simple gift that’s sure to give him a good laugh!